I will teach on the subject of insight, Bhikkhus, an explanation of the principles. Nibbedhika means 'penetrating, piercing, scrutinising, sharp'; dhamma here most likely means The Dhamma, that is the Dhamma (capital Dh), as law or principle, the teachings of the Buddha. Pariyāyaṃ is an interesting word. The root is √yā meaning 'going, moving' which also gives us the word yātrā meaning a journey expedition, or a pilgrimage. √yā is a derivative of the Indo-European root √ei, from which we get the English word 'ion' (via the Greek ienai 'go,') - so called because the ionised atoms in a solution move towards an electrode of opposite charge. The prefix pari- usually means 'around' so the underlying meaning is 'to go around'. So it comes to mean something repeated - such as a ritual or a mantra - and via this 'teaching' since teaching was done by repetition. It is drawing on a central metaphor in Indian culture - the way that things repeat themselves according to certain laws or principles and the rituals that base themselves on this repetition; the way that stories are told again and again in the same way; and also the way that oral teachings are handed down through repetition. As such it can refer to the going around, or what makes things go around, ie "what is going on". The -ya suffix indicates adjectives which have the sense of 'relating to'. So pariyāya is relating to what goes around, or the underlying principles of what goes around. As such we could see dhammapariyāya as a play on words, because dhamma shares much of this semantic field. The abhidhamma used pariyāya as a label for a more figurative (i.e. metaphorical) discourse as opposed to something more literal, but I'm not sure it applies to this sutta as the ideas are quite straight forward. Basically the sutta looks at various factors of experience and analyses them in terms of cause (nidānasambhavo), difference (vemattatā), result (vipāko), cessation (nirodho) and way to bring about cessation (nirodhagāminī). In many ways it's quite a straight-forward Buddhist text on conditionality. It's similar to many other presentations, especially those related to the Four Noble Truths. However amidst this rather arid analysis is a few lines of verse. I find Pāli verse difficult to translate, but having seen someone else's translation I knew I wanted to have a go because the message of these lines of verse is rather striking. Not those beautiful aspects of the world. Though the wise give up desire. As I say I found this striking if only because the Pāli texts rarely use this kind of language. An important distinction, a very important distinction, is being made here. This is a rare reference to beauty and it's response is not the usual rhetoric - that what we find beautiful is in fact ugly. Here the beauty of the world is not denied, but admitted. The word I am translating as beauty, by the way, is citra - you won't find this in the Pali Text Society's Pali-English Dictionary (which I usually refer to as PED following scholarly convention). I found it in the Vipassana Research Institute dictionary which accompanies their Pāli Canon CD. The word is the same in Sanskrit where the primary meaning is 'conspicuous, excellent, distinguished; conspicuous, excellent, distinguished, bright, clear, bright-coloured' but covers senses such as 'variegated, agitated, manifold, strange, extraordinary'. In short it describes the world (loka) in all it's strange and wonderful forms. And the thing that a person (purissa, literally 'a man') is passionate about is their saṅkappa. PED defines sankappa as 'thought, intention, purpose, plan'. I can't resist one more etymology because kappa (Sanskrit kalpa) is from √kḷp which has the distinction of the being the only Sanskrit verbal root to contain the vowel 'ḷ'. Kḷp in fact suggests 'ordering' and with saṃ- is in Sanskrit: 'to bring about, to desire, to produce' (saṃ- changes to saṅ- when followed by k). Switching back to Pāli it seems as though the literal meaning has been colonised by a figurative one which only relates to the mental sphere. So what a person is passionate about, or overcome by, is what is produced in their own minds, what is desired in their own minds - in relationship to the beauty in the world. A corollary of this is that removing anything beautiful from the world, or scorning the beautiful is not going to solve the problem, because the problem is not with the world, but it is with how we see it and respond to it. My own teacher has extolled the virtue of beauty even, because art - great art anyway - can lift your consciousness and being to a higher level. If fact his definition of art focuses on this potential for raising us up. Natural beauty also can refresh and inspire us. We need not be too puritanical about beauty. We need not be puritanical at all, just observe what our mind is doing in response to the world and make rational decisions on what we have observed. The image which comes to mind for me is a moth dancing around a candle flame. While the candle flame is far from permanent, it does to some extent represent a fixed point around which the moth flies it's crooked path. Beauty in the world is just like this - it remains (tiṭṭhati) as the text says - and the problem is that our moth-like minds are enthralled by it, and occasionally we fly into the fire and are burned by it. Like the moth however we often do not learn from this, but fly at it again and again because the light seems irresistible. Fortunately we are not moths and we do, as I pointed out a couple of week ago [Do we have a choice? ], have some choice in how we respond to the world, the light is resistible. So the wise person (dhīra) gives up desires (chanda). That is to say that the wise person reflects on their responses to sensory stimulus and figures out that the basic, inbuilt, habitual responses just don't bring happiness or fulfilment; and so they re-evaluate their relationship to seeking pleasure. I plan to say more about this in a couple of weeks. * Nibbedhika Sutta. AN 6.63. (PTS: A iii 410). My translations. Also translated by Bhikkhu Thanisarro @ Access to Insight, and by Piya Tan @ Dharmafarer. 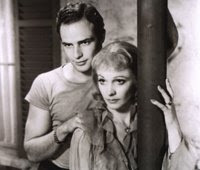 Image: Marlon Brando and Vivien Leigh in A Street Car Named Desire. Dr Marco's High Quality Movie Scans.